They think that since they created an eBook or a content upgrade to generate leads from the site, then, naturally, they resort to only promoting it there. They create relevant calls to action, build landing pages, and use a multitude of strategies to drive traffic to them. But in the process, they greatly miss out on many incredible (and simple) lead generation opportunities. 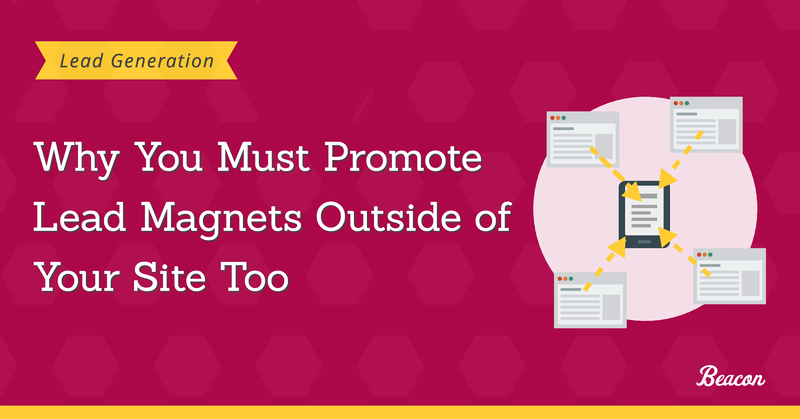 So, in this post, I decided to discuss why you absolutely must promote lead magnets outside of your site. And then, show you a couple of simple opportunities to do so. So, Why You Should Bother With Reaching The Audience Beyond Your Site? It’s simple because otherwise, so many people who could download your eBook or content upgrade would never even hear about it. You’re typically attracting only a tiny fraction of your potential audience. Here, let’s jump ahead and use one of the strategies I’m going to be talking about later in this post as an example – reposting to Slideshare. According to SEMrush, Slideshare receives 4.9M organic visits a month. And let’s be honest, try as you might, you stand little chance of achieving similar results fast. However, the size of a potential audience you could reach isn’t the only reason to start reaching beyond your audience. You can be more specific as to the type of audiences you target. Fact: when driving traffic to your site, you focus on specific people you want to attract. You optimize the content for keywords relevant to them, and share your content only on social networks they frequent. But reaching beyond the site gives you an opportunity to attract different groups of leads, who might also be interested in your products or services. And, promoting the lead magnet beyond your site gives you the opportunity to test different approaches to lead generation. A greater traffic allows you quickly assess how good the strategies you use to convert visitors really are. And in turn, greatly improve your conversion rates. I already mentioned this strategy, and hinted at one of its biggest benefits – the ability to target Slideshare’s huge audience. You see, since 2012, Slideshare is part of LinkedIn. And as a result, publishing on the platform gives you automatic access to the social network’s audience. 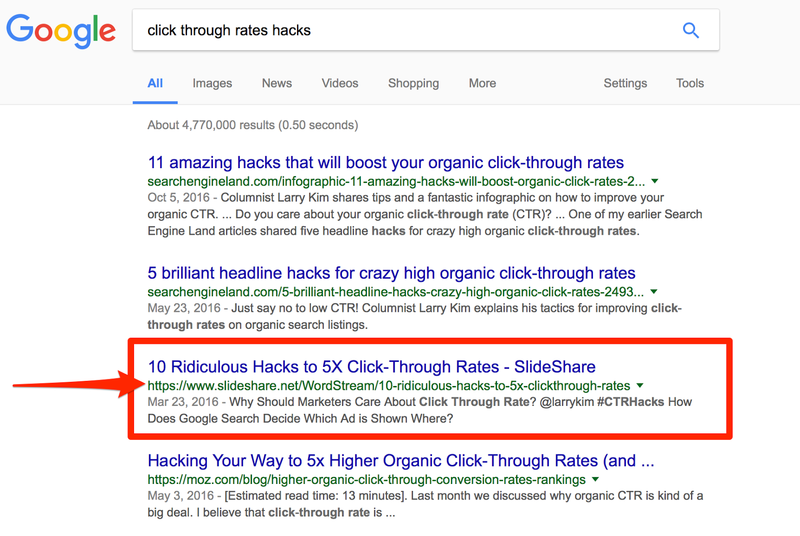 Given the site’s domain authority, it’s actually much easier to rank a Slideshare presentation for competitive keywords, than even the most compelling blog post. Don’t believe me? Then take a look at the example below. This slidedeck ranks at no. 3 but look at the other domains ranking for this keyword. All are hugely authoritative sites with a massive following and high domain authority: Search Engine Land (two results) and Moz. Even with my knowledge of SEO, I can tell that it would be pretty much impossible to rank a small business site among them. But Slideshare… well, it’s there, isn’t it? Of course, to do that, you need to optimize your presentation for the keywords you want it to rank, but that’s obvious, isn’t it? Also, when creating the presentation, make sure that you include the keywords in the content (meaning, on the actual slides). Slideshare transcribes your slides and includes the transcript on the presentation’s page. And needless to say, this will greatly help to rank the presentation for those keywords. Then, include a call to action to the eBooks landing page, where visitors would be able to download the full lead magnet. Another common lead generation mistake is thinking that you shouldn’t be promoting your lead magnets to existing leads. And I take the reasoning behind this thinking. After all, you launch them to attract NEW subscribers, not entertain the existing ones, right? By showing your existing leads any new advice you share, be it a new blog post or a checklist, you build the image of authority, and highlight your expertise. And needless to say, you never know when someone decided they’ve seen enough and are now ready to hire you. So, every time you create an eBook, develop a web version you could easily distribute via a shareable link. Where to Promote the Link? Include it in your email signature, so that everyone you email could learn about it. Add the link to your author bios on other websites. This is particularly helpful if you use guest posting to attract more visitors to your site. With the shareable link, you can drive them directly to your lead magnet. Add it to your email newsletter too. But apart from sending custom newsletter regarding the eBook or any other lead magnet, place a permanent link in the footer. This way, subscribers who’ve missed the original announcement will still be able to discover it. Use it in your Quora answers. Seek out and answer questions relevant to your lead magnet’s topic, and include the shareable link in your replies. Finally, submit the link to relevant industry sites, Reddit subreddits, and any other places where your potential audience hangs out. There are so many ways to attract visitors to your lead magnet. But at the same time, when you resort to promoting it only on your site, you greatly miss out on many lead generation opportunities. Hopefully, after reading this post, you have a clear idea why you should be spreading the news about your eBook beyond your site, and how to do it.